Just because your child is young doesn’t mean he or she can’t be laced up in the latest sneaker trends. There are plenty of looks to choose from for both boys and girls that will make their feet the talk of the playground. For boys, you can’t go wrong with a pair of Nikes. The Boys’ Toddler Lunar Forever 2 comes in a subtle color combination, but the design will keep him looking and feeling great. Lunarlon foam ensures soft landings no matter where he chooses to play, while Flywire technology keeps this shoe snug. Another great option for the little man in your life: the Boys’ Toddler Jordan Flight SC 1 Basketball Shoes. Not only do these sneakers look cool, the high top style will provide maximum support for his growing legs. Girls have their choice of sweet shoes this spring, too. 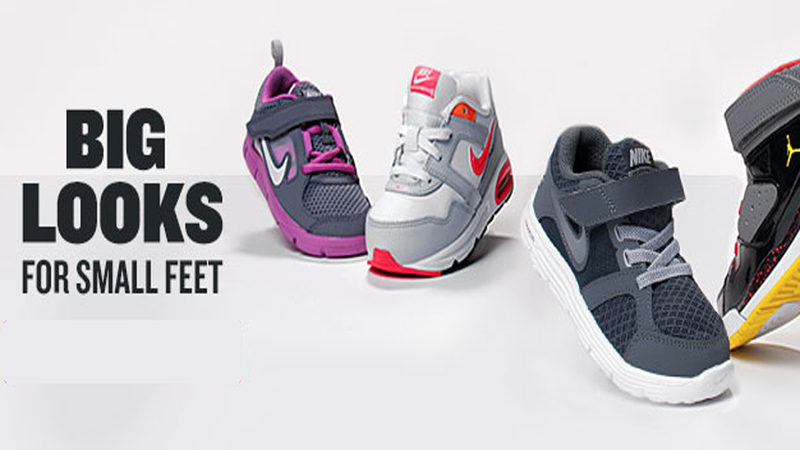 For optimum support, check out the Girls’ Toddler Nike Air Max Navigate Running Shoes. She’ll be cool and comfortable all day long and still have enough energy to play hide and seek before bedtime in these shoes. The Air unit provided maximum impact protection while a cool white, pink and orange design will please even the pickiest athlete. The Girls’ Toddler Nike Free Run 3 is a great option for girls always on the go. This super light shoe won’t get in her way and allows for speed and flexibility. Available in two bright designs, she won’t forget to lace up if you add these to her wardrobe. No matter what activities your child enjoys, there’s a great pair of comfortable and durable sneakers to see them through. When it comes to outfitting your budding young athlete, Finish Line has the goods.